One of the most important times of the day in our classroom is calendar and morning work. Besides coming into our classroom ready to work, putting our backpacks in cubbies and making sure we all have a lunch, the routine of calendar and morning work sets the tone for the day. 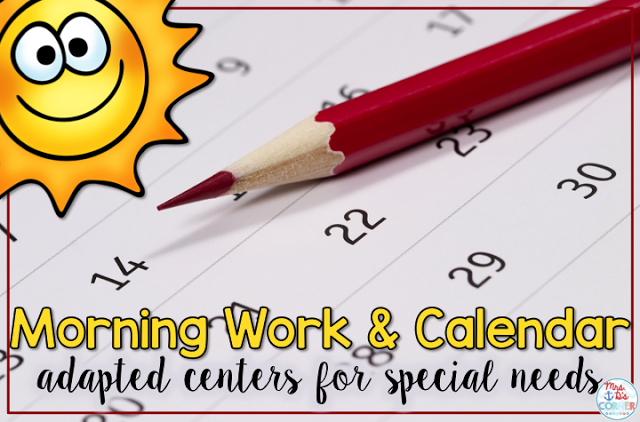 Okay, so I don’t *really* feel this enthusiastic every morning, but you’ve always got to start the morning off right!At the beginning of the year, we focus on learning *how* to appropriately work through calendar center as a class. And it all begins with sitting at our seats working on the daily calendar. This is what our calendar board looks like. We start with “Today is …” We will talk about what number day yesterday was and what comes next (meaning what today is). Each student then tells me the current date, whether it be verbally or with an assistive device. By the time we finish our calendar work, the morning announcements come on and we say our pledges. We start with the Pledge of Allegiance and then we say the Texas Pledge. Our school also does this really awesome thing called GRIT; each semester the students say a different pledge to themselves. Something along the lines of “I take pride in me, in all that I can be…” or “Got a problem? Talk it out. Work together, don’t scream and shout!” One of my little friends should really be the poster child for GRIT because she absolutely LOVES the pledges and talks about the GRIT vocabulary all the time. I love it! After we finish the morning announcements, we take our morning potty break rotations while the others work on their morning work and calendar notebooks. I keep the daily (days of the week) work in labeled folders. It makes it easy for me to grab a folder in the morning, count out the appropriate number of student pages and pass them out. 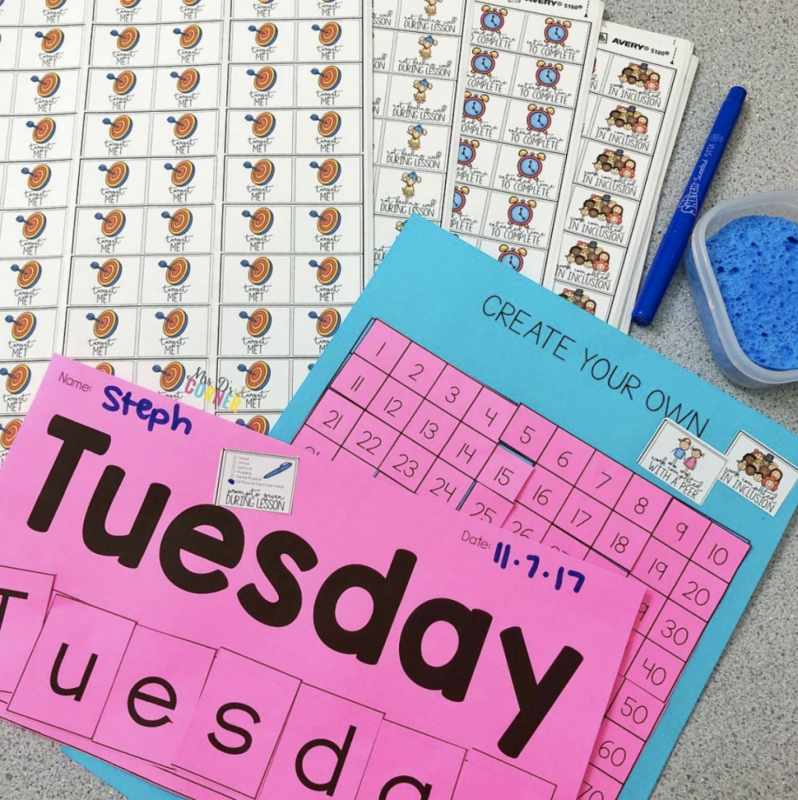 Students get to practice writing, coloring, and tracing the day of the week multiple times. Those two sheets (top and bottom right) are copied front/back and the cutting and pasting sheet is separate. The great thing about using all 3 of these *free* daily sheets is that I can work 1:1 with a student on the cutting/pasting sheet while the other students work on writing. I can rotate through all of my students while others work independently. For my friends who have vision impairments, or for those who need more engagement in the activity, we use Mr. Sketch markers to color the page (like show in the video above). Not only does it make it smell yummy (as long as we don’t use the Nacho Cheese marker… yuck! ), but it gives me the chance to make more direct prompts. Instead of saying, “cut on the line” I can say, “Cut on the brown line.” I use different colors every day so it doesn’t become a rote thing for me or for my friends. It’s great for gluing too because students can color in the box themselves and I can verbally prompt them to “glue only in the blue box” or, “What letter comes first? Make sure it goes at the beginning of the blue box!” It gives them a great visual (that smells delicious) to keep them on track. To learn more about Glue Sponges in Special Ed, like seen in the video above, click here. 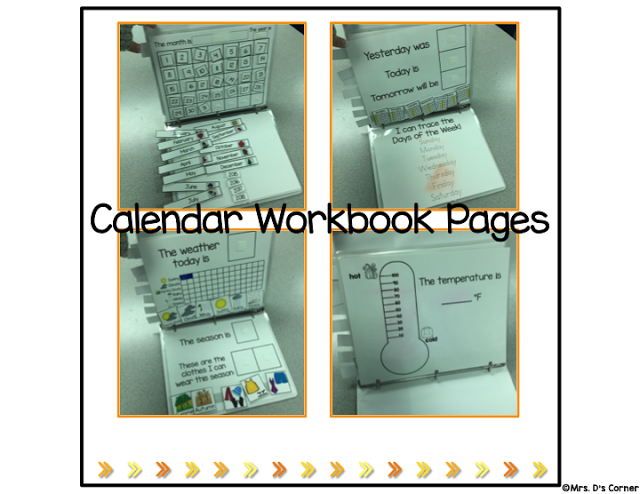 Once a student finishes the 3 writing pages, they start working on their individual adapted calendar notebooks. 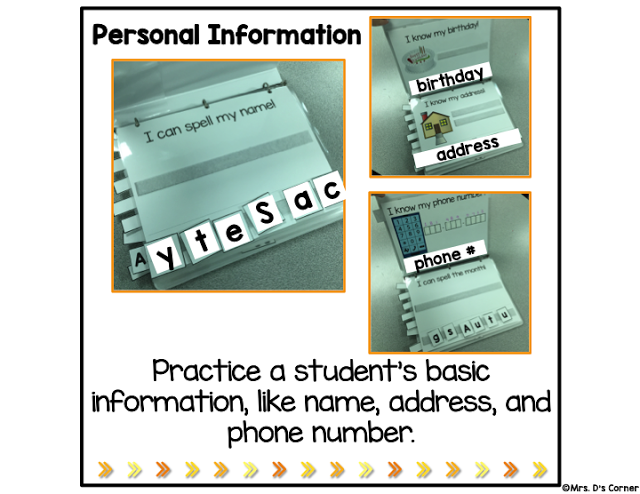 To start the school year, we have been working on writing personal information, like our name, birthday, phone number, and address. Then the notebook goes into more depth about what we talked about during calendar center at the front board. By the end of September, we’ve got it down and it becomes something students can start working on independently. As students master these skills and become independent (and quick!) at completing their calendar workbooks, I plan on adding more academic pages to their notebooks. Depending on the student, I will most likely add counting pages, alphabet tracing and recognition, matching pages… basic skills that the student has already been exposed to and does well with, but needs a little more practice. Plus it makes it easy for me to just check their notebook for progress monitoring data! I’m impressed. This is amazing.